Did Michelle Obama spearhead the #FertilityMeToo Movement? I sure think so! And I spoke about it on my last Egg Whisperer Show. While on Good Morning America, the former first lady got personal. She courageously spoke about her own struggles with fertility and the choice to do IVF to conceive both of her daughters. Her story is a victory for fertility. 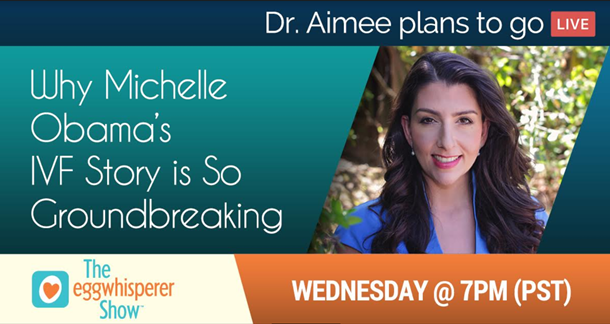 By sharing her story Michelle is imploding the stigma associated with fertility. And I could not be happier about it. Plain and simple fertility and everything that comes along with it needs to be talked about more. This is especially true when it comes to infertility. Isn’t it interesting that when people share a secret—something deeply personal—that there is a good chance you can relate on some level? Or know someone who can? The same is true for fertility. And now, the same is true for Michelle Obama! That’s right -if you are struggling with fertility or did IVF then you have something in common with this fabulous lady! Pretty cool club to now be part of, huh? I’ve said this once or twice before (wink) and I’ll say it again until someone finds a way to make a bumper sticker out of it; There is no BOTOX for your ovaries. Women are born with the gift of fertility. It’s a precious resource that depletes with age. Once it’s gone—it’s gone! Michelle isn’t alone. If you’re struggling with infertility, you are not alone. If you’ve done IVF you are not alone. In fact, you are part of a bigger and growing club. This is a presidential club, ladies! Embrace it! IVF isn’t new—yet it’s still hush-hush. It’s time that ends TODAY. Thank you, Michelle, for spearheading the end of the fertility whispers. *Fun Facts: 5 million babies have been born from IVF. The oldest IVF baby is now over 40. Fertility problems touch all of us. It’s hard to find a single person anymore that doesn’t know someone who has gone through infertility—be it a miscarriage or done IVF. Society’s timeline for life milestones has shifted—we’re doing things like getting married and starting families much later. Our fertility isn’t taking anti-aging pills. Therefore we need to proactively preserve it to protect our best chance at conception when we’re ready. Or do IVF to conceive if necessary. Infertility is painful—and it’s deeply personal. This shouldn’t come as a surprise, but given Michelle is just now telling the world about this is a nod towards how deep the wounds from infertility can be. (And yes, I know she’s just released a book so the timing lines up, but either way—she’s a hero in my eyes). Many people struggle in silence. Communicate to show you care. It’s a way to be a leader among other women in your life. Let people know they aren’t alone simply by giving sharing your voice. It’s something you can share with the former first lady, Michelle Obama. Suddenly talking about fertility doesn’t seem so scary or shameful anymore, doesn’t it?